Anna and Wendy discuss episode 64 of Chronologically LOST, Episode 064 – December 3-5 2004 (day 73-75), featuring Juliet’s punishment for killing Pickett, Sawyer letting Karl go and getting into a fight with Kate, the Others moving islands, the daily lives of the freighter recruits pre-recruitment, the discovery of Oceanic 815 in the Sunda Trench, and Michael’s attempts and suicide and visit to Tom Friendly. Podcast length 1 hr 19 min. Anna and Wendy discuss episode 63 of Chronologically LOST, Episode 063 – December 3 2004 (day 73), featuring Ben’s surgery, the escape of Kate and Sawyer (plus Karl), and Desmond’s secret revealed to Charlie: he’s seeing flashes of the future. Podcast length 57 min. Anna and Wendy discuss episode 62 of Chronologically LOST, Episode 062 – December 1-2 2004 (days 71-72), featuring a trip to the Pearl, Eko’s confession and judgment, Colleen’s viking funeral, Juliet’s video secret message to Jack, and Jack seeing Kate with Sawyer on the monitors and finally agreeing to do Ben’s surgery. Podcast length 1 hr 13 min. 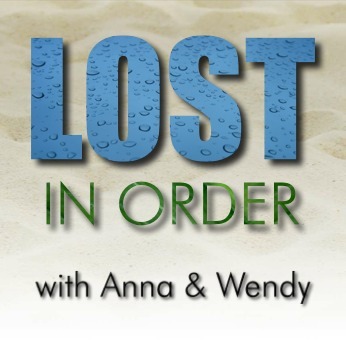 Anna and Wendy discuss episode 61 of Chronologically LOST, Episode 061 – November 30 – December 1 2004 (days 70-71), featuring Desmond’s lightning rod, Colleen’s surgery, Sawyer’s heart monitor, Kate climbing in and out of the cages, Michael crashing his car, and Jack seeing x-rays of a tumor on someone’s spine. Podcast length 1 hr 14 min.